Allison Berg spends a lot of time building bridges between different worlds. She sought the physical challenge of the military and the intellectual challenge of a science degree. She wants to serve her country, but she also relishes time among civilians. And now her research pursuits are taking her into the complicated intersection between the ocean and atmosphere. Berg is ready for duty. Following an undergraduate major in oceanography at the U.S. Naval Academy, Berg was chosen by the Navy and by the faculty of the MIT/WHOI Joint Program to pursue a master’s degree. 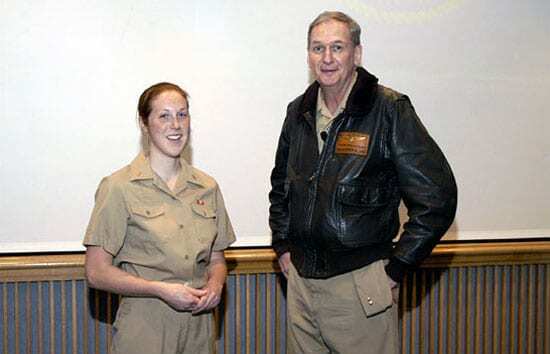 In March 2005, she was awarded the first Rear Admiral Richard F. Pittenger Fellowship for U.S. naval officers admitted to the MIT/WHOI program. 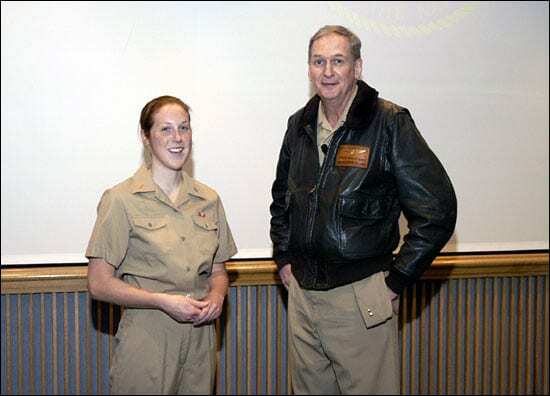 The fellowship was established in honor of the Institution’s former Vice President of Marine Operations, who retired in the summer of 2004 after 14 years at WHOI and 32 years in the Navy. “It’s an incredible opportunity to get a master’s this early in my career,” said Berg, who plans to work in meteorological forecasting and research for the Navy. The 23-year-old spent her most of her first year in classrooms and will spend most of her second working in the lab. In collaboration with WHOI Research Specialist Eugene Terray, Berg will conduct a field experiment using Sonic Detection and Ranging (SODAR) systems to study winds near the ocean’s surface. SODAR instruments bounce sound waves off the layers of air in much the same way that sonars detect the presence and movement of objects underwater. Researchers typically study the “boundary” layer between ocean and atmosphere with instruments fixed on towers. But such experimental work is limited by time, money, and geography: Fixed towers take a long time to build, they provide a glimpse of just the one environment they are in, and they are prohibitively expensive to install in deep-water regions. 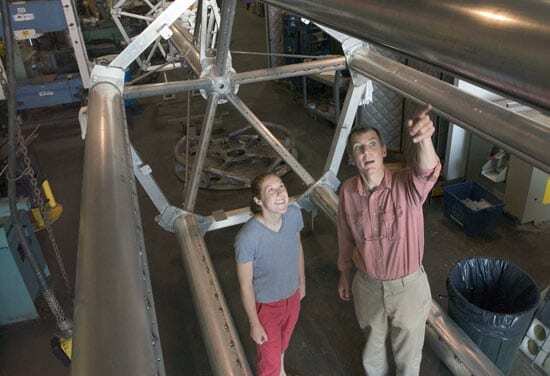 In their experiment, Berg and Terray will instead deploy their SODAR instruments on a portable buoy and compare their data with measurements recorded on a tower at the Martha’s Vineyard Coastal Observatory. “If SODARs could effectively be used on oceanographic buoys, then wind profiles could be obtained almost anywhere in the ocean,” said Berg. For instance, Navy meteorologists could set up temporary SODARs in deep water to gain a clearer picture of weather patterns before an aircraft carrier group begins operating in a region. The experiment should have implications for the offshore wind power industry as well.